Clemmensen, L.B., Hansen, K.W.T and Kroon, A. 2014. Storminess variation at Skagen, northern Denmark since AD 1860: Relations to climate change and implications for coastal dunes. Aeolian Research 15: 101-112. Taking advantage of the fact, as they describe it, that "systematic observations of wind speed and direction have been collected at Skagen Fyr (Skagen Lighthouse), northern Denmark from December 1860 to August 2012," Clemmensen et al. (2014) employed these data to develop a concomitant history of wind-induced storminess over this period of time, when the Earth transited from the extreme cold of the Little Ice Age to the less debilitating heat of the Current Warm Period, while noting that "the chosen site is considered to be representative for the wind climate of the central North Sea and SW Scandinavia." As illustrated in the figure below, this work revealed, in their words, that "between 1860 and 1875 storminess (wind events exceeding Beaufort 8) is extremely high, but since then storminess decreases." And they note that, concomitantly, around 1870 the annual drift potential (DP) of coastal dunes was "also extremely high and reaches up to 9600 vector units (VU, knots)." But they say that "since 1980 DP levels are below 3000 VU and decreasing," which significant "shift in wind climate towards less storminess is seen at a number of stations in NW Europe." Figure 1. 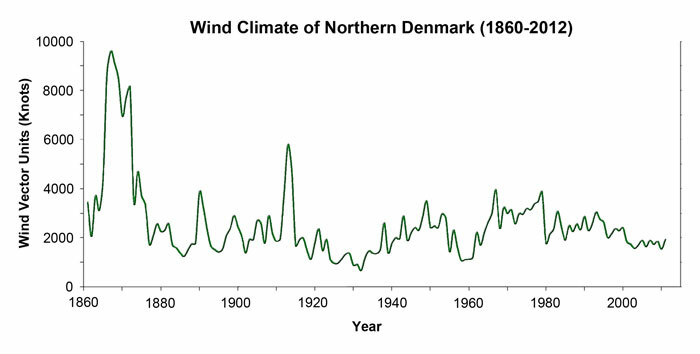 Wind climate for northern Denmark over the period 1860-2012, expressed as annual drift potential (a measure of wind power). Adapted from Clemmensen et al. (2014). And so we have another refutation of the climate-alarmist claim that global warming - which was an historical reality over the period of Clemmensen et al. 's study - tends to increase storminess, when in actuality it is shown via their analysis to do just the opposite.